Mark Pogue captures the imagination of strengths students in a session at the Nebraska Union. A celebration honoring Pogue’s life happens Thursday, September 13, 5-6 p.m. in the Henrickson Family Atrium at Howard L. Hawks Hall. The event is open to the public. Pogue dedicated his life to creating and delivering development programs for students, including 15 years as a senior learning and development consultant at Gallup. He founded Gallup’s Higher Education Division, bringing his expertise in strengths to engage executive leadership in higher education. He joined the Clifton Strengths Institute board in 2010, and his charismatic personality was a natural fit to launch the Clifton Strengths Institute at Nebraska Business. 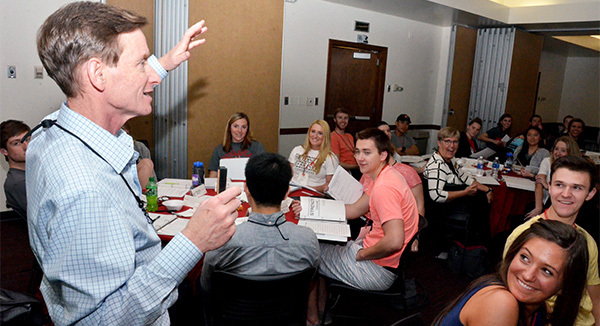 Whether speaking to freshmen students about how to utilize strengths to find happiness and fulfillment, or speaking to employers about becoming aware of how to improve productivity and create a better quality of life for everyone, Pogue sought to plant seeds of growth in his interactions. He believed in the strengths-sciences engineered by former Nebraska professor Dr. Don Clifton, and emphasized it to everyone at the college. “I can’t think of a better way to help our students be successful and reach their potential than by starting their college career with a program that helps them identify their natural talents and strengths, and then provides them with individualized coaching to apply those strengths towards their goals,” Pogue said when introducing the first class of student strengths coaches in 2016. Students across campus reacted to Pogue’s message by upwards of 80 students serving as strengths coaches each year. Students also responded by applying to the ground-breaking Clifton Builders Program designed to identify high-potential student entrepreneurs to provide leadership and change the world through community building and innovative new business ventures. Mark Pogue speaks with Clifton Builder student Phat Nguyen on the Nebraska campus about his future plans. Pogue is survived by his wife, Jami, and two daughters, Paige and Reilly. Parents, Jim and Barbara Pogue, brother, Matt (Renee), in-laws, Jim and Linda Flannery, brothers-in-law: Ryan (Lorena), Kent (Jennifer), Taylor (Nicole) Flannery and nieces and nephews. Donations may be made to Lincoln Young Life. For those in the CoB community, visit: https://giving.younglife.org/MarkPogueCBA, and for the general public, visit: https://giving.younglife.org/MarkPogue.